New Mechanical and Electrical services provision for existing South Building and Entrance Atrium with interconnection with existing North Building services strategy to centralise main mechanical and electrical services plant. 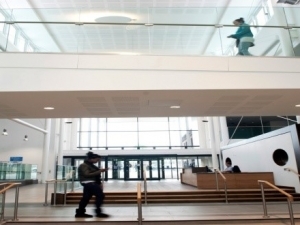 New services consisting of natural ventilation were possible with dedicated air conditioning to specialist teaching areas. High efficiency lighting throughout with dynamic daylighting linked to central management system. New IT provision to suit teaching requirement via structured CAT 6 cabling installations.